Attempting to work my way through the sock yarn stash, I got Rosemary Hill’s eBook Seven Small shawls. The patterns are meant for sock weight yarn, and I have enough of that to make 24 pairs of socks. There will be seven patterns, plus a few goodies, released over the course of the year. Two are out so far, and the second one caught my eye: Maia (Ravelry link). Started it with Artyarn Ultramerino 4 from the stash. The yarn came from a sale when Chris Needlecraft shut down a year ago, I have 3 skeins of the imaginatively named colour 133, which means I have about 120yds extra to make the shawl a bit bigger. 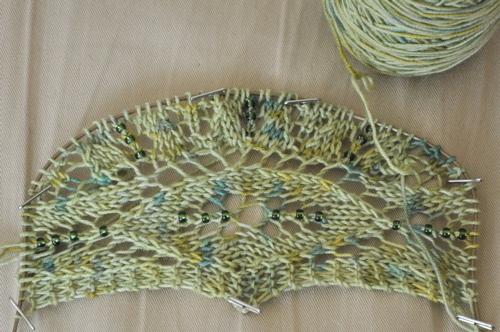 Made it through the first four charts without incident, including picking up stitches and adding beads. Lots and lots of beads. They are from Artbeads, silver-lined olivine 6/0 seed beads. Hubby picked these out of the three colours I tried against the yarn. The construction is new to me, instead of a three stitch garter border, you have a lace panel, started from a provisional cast-on. That big O in the middle is the centre point. LOVE! the yarn and beads you are using! And now I’m in love with that shawl, too. In fact, I just bought a couple of skeins of Jitterbug that may need to become that shawl….especially as I have beads that go with perfectly! Never thought of beads in a shawl! I love beads and knitting! Looks like a fun project…is it for you or gift? I am working on a Norwegian doll sweater for my goddaughters American Girl doll in red and white. It is pretty mindless but I can still get into trouble with the pattern at knitting group if I get to talking too much! I can only imagine with beads! Hope you keep taking photos to keep us updated! Next Next post: 15th wedding anniversary!